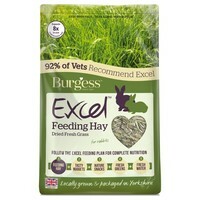 Burgess Excel Feeding Hay (Dried Fresh Grass) is a delicious pure, dried natural grass, which is dust extracted and additive free and has a higher nutritional value than hay. The gentle drying process seals in the natural flavour, making it tempting to even the fussiest eaters. Dust extracted for good respiratory health. This hay is very green and fluffy, a has a nice thickness for bunny teeth. Best of all, they love it!! Burgess Barn Dried Forage is even fluffier than meadow hay, making it a soft and insulating bedding. The long, lush strands also hold well in a hayrack unlike many Timothy hays. The 55% fibre content is significantly higher than meadow hay, although not as impressive as Burgess Birch Bark/ Chamomile Herbage's 63% which I also recommend. My guinea pig relishes it and the 1kg bag has lasted longer than I anticipated - cannot praise it enough! My guinea pigs enjoy this hay and the 1kg bag lasts a good while.